SPORTMiX® Wholesomes™ Golden Dog Biscuit Treats are a great reward for your dog or a perfect training aid. SPORTMiX® Wholesomes™ Golden Dog Biscuit Treats help your dog’s teeth remain clean and healthy. Particles in soft foods frequently stick to the teeth of dogs. This results in tartar build-up and bad breath. 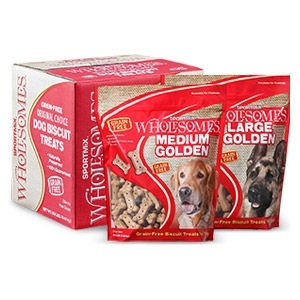 Wholesomes™ Dog Biscuit Treats are naturally preserved and 100% guaranteed for taste and nutrition. These biscuits are available in medium, large, extra large and jumbo-sized bones.